The brand new Ravenna-Cowen National Historic District is featured in today’s edition of the Daily Journal of Commerce! Larry and Lani spearheaded this undertaking, and along with a team of neighborhood volunteers researched, described, and categorized more than 400 homes. This classic Craftsman bungalow is in the Ravenna-Cowen North National Historic District. 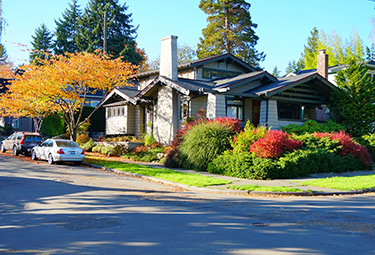 Ravenna-Cowen North in Seattle is Washington’s newest National Historic District. The district is roughly bounded by Northeast 65th Street on the north, Ravenna ravine on the east, Ravenna and Cowen Parks on the south, and 12th Avenue Northeast on the west. Friends of Ravenna-Cowen said in a release that the new district includes 443 homes, most built prior to the early 1930s. The character, scale and setting represent the period of population growth and home building that followed the 1909 Alaska-Yukon-Pacific Exposition at what is now the University of Washington, and lasted through the Great Depression of the late 1920s and 1930s. The architectural styles in the district are mainly Craftsman, Tudor Revival and Colonial Revival. Many designs were taken directly from pattern books and kit home catalogs from the early 1900s to the 1930s. The historic designation application was prepared by Friends of Ravenna-Cowen, a volunteer nonprofit focused on the heritage of the neighborhood. Larry E. Johnson, a member of Friends and principal of The Johnson Partnership, worked pro bono as lead historian for the project. The area was entered into the National Register of Historic Places on Sept. 13, after being approved by the WA Advisory Council for Historic Preservation, and added to the Washington Heritage Register. An interview with our own Howard Miller is currently featured on the business and branding website Bontena. Howard discusses what inspired him to become an architect, the design and building process, and the challenges of building a new house in booming Seattle. We’re pleased to share the portfolio of a recent kitchen remodel we wrapped up earlier this fall. The 1925 house in West Seattle is a Prairie-style Sears kit home. Katherine Buker of Buker Bespoke did the remodeling work, which included tulip-motif cut-outs in the cabinets. Portfolio images by photographer Jim Houston. You can see the entire portfolio here. Last weekend we were pleased to be the featured architect at the Wallingford Historic Homes Fair at the Good Shepherd Center. This annual event features local designers, builders, and suppliers offering expertise in historic renovation and preservation. The event also included lectures, seminars, and “Ask-an-Expert” panels, and covered topics such as researching your home’s history, earthquake retrofitting, and the process of landmarking historic buildings. Howard and Audrey represented the firm and met a variety of homeowners, from renovation veterans to new homeowners seeking inspiration.